The activity packet warned us about bears in the area–black bears, specifically. A full page of things to do and not to do around the cabins. To prove that men do not often read information, one of the men (name withheld to protect the not-so-innocent) in the family put trash out in the afternoon. 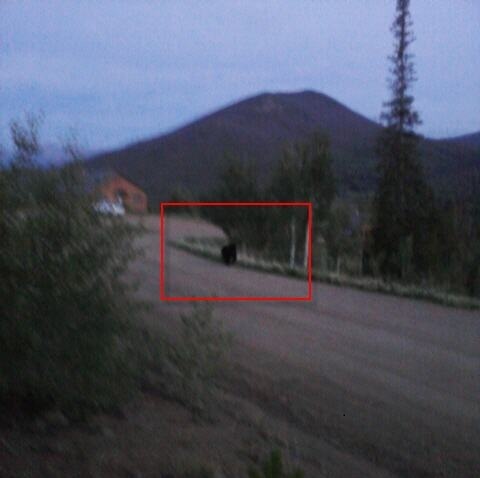 That evening, my brother-in-law spotted a smallish bear outside our cabin. He called on his cell phone to tell everyone while he followed the bear around the back of the cabin in a wide circle. A few of us ran outside (I know, crazy) to watch him follow the bear. Here’s a picture he took from his cell phone. The bear is in the red box.Those of us outside watched from a greater distance while the cell phone photographer got a couple more pictures of the fleeing bear.We spent the rest of the week teasing him about chasing bears. I don’t think he’ll ever live this down. Later that night (1:30 am), my husband and I heard a terrble noise outside our room. We had a first-floor, corner bedroom, and the cabin trash container was in front of one of our windows. Something was trying to open the trash container. What do you think we did? We got up and looked out the window, of course! My husband shined a flashlight into the growling bear’s face. It was much bigger than the bear that my brother-in-law chased followed the day before. There we were standing three feet away from a very large black bear with nothing but a window and a wooden trash container between us. With more noise from us and the flashlight blinding it, the bear disappeared into the darkness. I’m so glad we weren’t in grizzly bear country (which is only in the far northwestern part of the country, according to my very knowledgeable 14-year-old). My husband managed to take a few pictures of the bear, but I won’t post them. They are about as interesting as a black bear on a dark night or a polar bear in a snowstorm. Nothing to see. Needless to say, I didn’t get back to sleep for a long time. In the morning, we found that the bear had pulled the trash container door hard enough to break the latch. A simple push on the door gave the bear access to the trash bag inside. 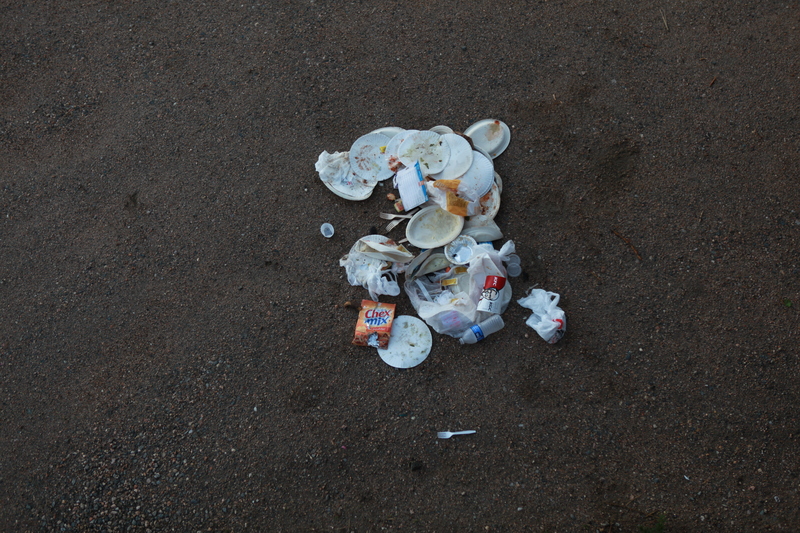 It was quite a mess.You would think after TWO bear encounters in less than 12 hours, the family would get the message about putting trash out. The next night, the same big bear paid us another visit and took out the trash again. I scared it off when I opened our bedroom door. The hallway light was on, and it streamed into our room. The bear ran away before my husband could take any pictures (sorry, Honey). I did get a picture of bear paws in the morning. With another trash mess to clean up, we got our act together about the proper time to put out the garbage (before noon, so the facility could collect it before 5 pm). The third night, my 14-year-old waited up to see the bear. It showed up around midnight–a black ghostly form in the dark. 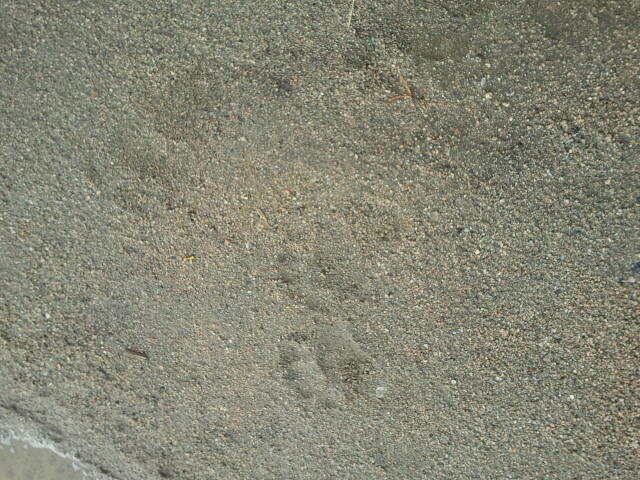 Without trash to keep its interest and with the noise we made looking for the camera, the bear left. The bears knew which cabins had the older, not-bear-proof trash bins. They were known to follow the same path every night. Lovely. I heard the big bear one other night, but it left us alone for the rest of the week. Now that we’d gotten the trash pickup schedule down. Sheesh. Do you know what are you supposed to do if you encounter a bear? This website has great information. It also differentiates between black bears and grizzly bears. If you want to check out were we stayed, go see the YMCA Snow Mountain Ranch blog. The Rocky Mountains are beautiful (that’s saying something since I grew up near the coast and love the beach). What wild animal encounter stories do you have to tell? Share in the comments below. I’d love to hear from you.